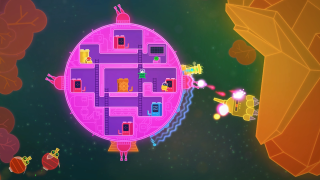 The PC Gamer Show called Lovers in a Dangerous Spacetime one of the "sleeper hits of 2015". If you haven't heard of it, it's a frantic co-op game where you manage a colourful spaceship either with a real-life friend or an AI "space-pet", with inevitably more tasks than you have people: piloting the ship, shooting the weapons, operating the shield, etc. It's been in development for years, but it finally has a release date: September 9. Check out the release trailer to see just how intense things can get for the crew of the neon spaceship, and to watch a space-cat fire lasers. If you want to find out why Evan described Lovers as "like playing Mario inside FTL", check out his hands-on.